Erect the Eric Soza statue soon UTSA, the dude deserves it. When you point back to the genesis of UTSA football, Soza is page one, paragraph one. The three year starter gave the fledgling program a face, consistent play, credibility, and, most importantly, wins. While we're at it, go ahead and put up a statue of Larry Coker. Remember when that guy was left for dead, a dinosaur after his stint in Miami? Coker took some time off and reinvented his offensive and defensive philosophies but more importantly he continued to be Larry Coker, the solid recruiter and better gameday coach. We predicted doom for the Runners in 2013. We were wrong. Let's get them up on the table and dive into their season. 2013 didn't start particularly well for UTSA. A win at New Mexico was followed by losses to Oklahoma State, 'Zona, and, hard after a victory over UTEP, 3 straight losses. So you're UTSA, you're playing in your second FBS season, your third overall, you've made a tremendous jump in level of competition, what do you do? You reel off 5 straight in conference including two over bowl bound squads Tulane and UNT and finish a respectable 7-5 and a beyond respectable 6-2 in conference. Due to NCAA rules the Roadrunners weren't allowed to go to a bowl game. The NCAA and their rules and stuff. In 2012 UTSA ranked 123rd out of a 124 FBS programs in defensive efficiency. In 2013 they climbed to 71st. A 52 slot climb is impressive, but more so when you consider the jump in competition in 2013. 71st includes games against 7 bowl teams. Part of that improvement can be attributed to greater offensive efficiency. The Roadrunners offense ranked 14th among FBS schools in drives of 10 plays or more. More offensive plays, more time of possession, less defensive plays. Triston Wade and Stephen Kurfehs helped the defense improve, significantly. This list could be longer but Wade and Kurfehs were two key cogs in the Runners defense. Wade made second team All-CUSA and Kurfehs, a three year starter anchored the middle after missing time early with injury. Wade and Kurfehs were 1-2 in tackles for UTSA. I know we said the list could be longer and then didn't list anyone else but we would be re-missed if we didn't mention Rashaad Mabry as well, the former Oklahoma State recruit was a disruptive force inside on the defensive line. Kam Jones was a swiss army knife. Jones averaged 10 yards a catch, 10 yards a run, 20 yards on kickoff returns, and was 0-1 throwing the ball and had 2 tackles. The junior from Edna was the most versatile athlete on UTSA's roster even without the tweezers. Jones played quarterback in high school giving him a versatility few can match. If Jones punted or did the PA announcements he'd have all facets covered. Turnovers popped the top on blowouts. The Runners were +4 in turnovers in games they won. By contrast they were -11 in losses. This is an over simplification, but UTSA's defense needed an efficient, clean offense in order to perform at a higher level. When the offense failed to do so and turned the ball over the wheels came off. Specifically, 9 of Soza's 11 interceptions came in losing efforts. UTSA was more than a match for most of its schedule, unless the Roadrunners turned it over. While the Bud loved Kam Jones' versatility, Jones only caught 34 passes in 2013, good for 25th in C-USA. UTSA's next two leading receivers ranked 45th and 48th respectively. UTSA lacked a go to receiver who could force a defense's attention. The Roadrunners preference was to shuffle units of receivers in and out of the game series to series, even down to down. It didin't work. Receiver by committee failed to yield many explosive plays. No ball hawks. The double edged sword. For all the defensive improvement, UTSA stlll didn't produce enough turnovers. The Runner's secondary had trouble playing the ball in the air and the defense as a whole wasn't able to separate the ball from the opposition. In the coming two years UTSA's roster will turn over almost entirely. Huge Junior and Sophomore classes will move on and UTSA will have to rely on a young nucleus. This class and next year's are critical for UTSA. Right now the Runners have 14 available slots and several need areas. Blake Bogenshutz is an all-everything quarterback from Carthage. 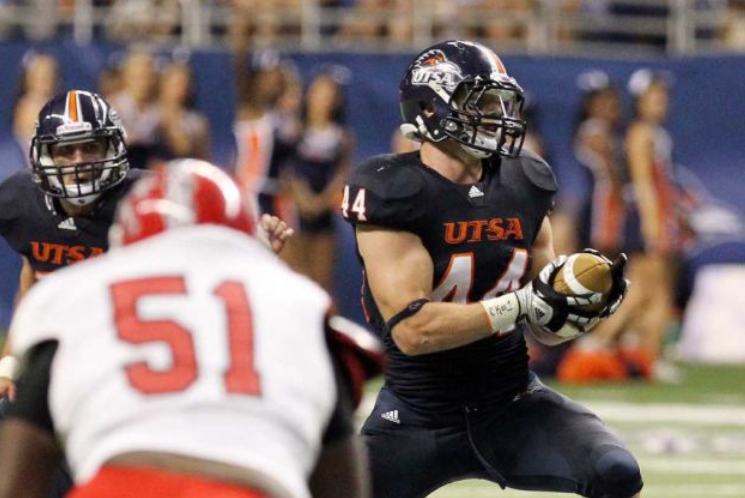 Undersized, he'll remind UTSA fans of Soza initially and may compete for playing time early. Bogenshutz isn't afraid to mix it up either. He was yapping with the rest in the Carthage/Kilgore state title game. In high school he backed it up. The Bud likes Greg Cambell, a flyer out of Atascocita. Campbell was recruited by Utah and Colorado State. Not a bad get for the Roadrunners. Blake got to meet Jerry and Jerry's new face. Coker has gone to his home state for two offensive weapons, John Neph and Cameron Oliver. Both have great size for their positions, wide receiver and tight end respectively. Coker and his staff will want to find some O-Line help which will be counted on for depth in 2015. Coker has does a great job finding talent in the Alamo City which is why the lack of such commitments is interesting. Certainly that will change. We'll find out how much the Runners have progressed or regressed quickly, trips to Houston and Stillwater in the first three weeks with a home date with Arizona sandwiched in between will provide a stern test. Let's just say we're looking at 0-3 rolling into the conference schedule. Tucker Carter is the favorite to take over the starting quarterback position, but he'll be pushed by Zach Conque. Both have better arm strength than Soza, but neither will walk in and be the game manager, improviser that Soza was. A tough schedule and a new quarterback doesn't bode well for UTSA, but then again we said the same thing before 2013. At least this year the Roadrunners will be able to go a bowl if they can replicate their success. Posted on January 5, 2014 by Sure Bud and filed under Southwest Round-Up, Sports and tagged Post-Mortem UTSA.